CardFlight's signature product, SwipeSimple, enables business owners across the US to accept a broad range of payments on the go, in their store, and at their computer. 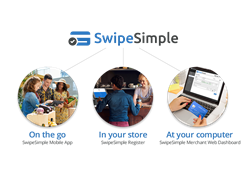 CardFlight, the leading SaaS payment technology company, announced today that its signature product, SwipeSimple, is now used by more than 50,000 small businesses across the United States. SwipeSimple makes it easy for merchants to accept payments on the go, in their store, and at their computer. The feature-rich product also provides web-based business management tools for growth and optimization. CardFlight works with Merchant Acquirers and Independent Sales Organizations, including 10 of the top 30 US merchant acquirers, to get merchants in every state across the nation started with SwipeSimple. The company will host CardFlight Conference, an industry event centered around small business payments, on April 9-10 in New York. The theme for this year’s conference is “Empowering Small Business...Together”. Attendees will gain new perspectives on the future of payments for small businesses and the growing number of businesses who rely on modern, secure, and easy-to-use electronic payments. Industry professionals can visit the conference site to learn more about the conference agenda and register. ● On the go with iOS and Android mobile apps and Bluetooth Low Energy credit card readers that enable EMV Quick Chip, contactless and magnetic stripe payments. ● At the computer with Virtual Terminal with Address Verification Service support for merchants who need to process card not present payments as well as the ability to save credit card data on file for scheduled payments, installment payments and recurring payments. ● In the store with optional countertop hardware such as receipt printers, cash drawers and tablet stands to replace the traditional cash register and payment terminal solution. SwipeSimple merchants can also access the SwipeSimple Merchant Web Dashboard with reporting and analytics, inventory management and additional business management tools to support their growth. About CardFlight: CardFlight is committed to building great software to make payment acceptance easy for business owners. SwipeSimple, our signature product, is used by more than 50,000 small businesses in all 50 United States. We reach businesses through a sales channel of merchant service providers, banks, and independent sales organizations. Ten of the top 30 merchant acquirers offer SwipeSimple as their preferred small business payment acceptance solution. Designing and delivering simple payment solutions that are easy to use have made us one of the fastest growing companies in America. In 2018, CardFlight was named to the Inc 500 List of Fast Growing Companies and the Deloitte Technology Fast 500. Additionally, Inc. magazine recognized CardFlight as the 5th fastest growing company in the Financial services sector. CardFlight takes pride in building and maintaining solutions that are ahead of the curve in technology, reliability, and user experience. Learn more at cardflight.com.